Sea kayaking with seakayakphoto.com: 9th Scottish Sea Kayak Symposium. 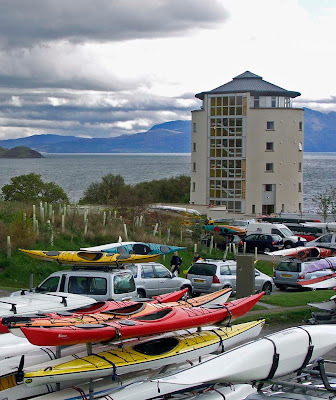 9th Scottish Sea Kayak Symposium. Organised by Gordon and Morag Brown, Duncan Winning and Ken Nichol and a myriad of supporters, the 9th Scottish Symposium was a great success. The range of activities was incredible and went ahead despite some pretty windy and wet weather. The event was also well supported by the trade, with a variety of stands and a huge demo fleet. Geoff and Anne from Kari-tek had even brought along a mobile shop! The opportunity to test boats back to back is a great reason to visit a symposium. I spent an afternoon with my Nordkapp LV against the Sea Kayaking UK Pilgrim (Romany LV), Rockpool GT, P&H Cetus and Cetus LV. I edged them to the point of no return and did about 50 rolls. The wind was a gusty 5 to 6 offshore with flat water. I am 5'8" and 200lbs. This is a small version of the classic Romany. It is designed for paddlers up to about 150lbs so I had to squeeze inh and I am really too big for it but I liked it straight away, it was so manoeuvrable. It had a nice low rear deck and the only sea kayak I have tried that was as easy to roll is the Anas Acuta. With my weight it did seem to have a limited top speed but it accelerated up to that very quickly. The finish on this boat was superb but I have to say that a demo Greenlander, one of my friends borrowed earlier this year, was not well finished round the cockpit and one of the compartments leaked. Despite much rolling, this one was dry as a bone. Smaller paddlers should definitely try a Pilgrim! The finish on this boat was stunning, the work of a master craftsman. It is a bigger hull than the Alaw/Alaw Bach but not so large as the Menai 18. The usual Rockpool cockpit ergonomics were superb. As you might expect, it felt faster than the Alaws but slower than the Menai 18. It edged superbly but it didn't feel quite as responsive to turning as my daughter's Alaw Bach. However, as a boat to do it all, including having decent space for camping trips, it is pretty much unbeatable and a welcome addition to the Rockpool fleet. Amazingly, I had not yet tried one! I like my trusty Quest too much! This is a big boat and the wide point is behind the paddler. However, it has a low foredeck and I was surprised how snug it was on the thighs, despite its size. The cockpit feels much smaller than the Quest LV but for most people that would just mean less padding. The stability on flat water was amazing, I think it will make a great platform for photography. You can hold it right on edge with none of the feeling of instability you get from a Quest at that angle. The Menai 18, which is also a big boat is equally stable on edge, so I was not too surprised about this. However, what did surprise me was how much the Cetus turned when on edge. Even in windy conditions I was nearly doing 360's with a sweep and single bow rudder. It is more manoeuvrable than the Quest and considerably more so than the Menai 18. Although the Cetus is very stable on edge, once you push it to the point of no return it goes very quickly. It rolls pretty well for a big boat but in comparison with the SKUK Pilgrim, it was a bit sluggish. In an afternoon of 50 or so rolls it was the only boat that I failed a roll in. Mind you I was getting tired and cold by that time! I would need more time in controlled conditions to be sure, but I think its maximum sprint speed is faster than the Quest but slower than the Menai 18. In the strong wind it tracked very well and responsively to adjusting the skeg at various paddling angles to the wind. I am not sure if I like the new locking ratchet skeg adjuster. In the gusts I do not think it was as directionally stable as the Menai 18. The only waves were the ferry's wash but the v bottom of the Cetus did not seem to slam as much as the flat bottom of the Menai 18. The construction and finish on the Cetus was impeccable. I was not expecting to like the Cetus as much as I did but it was so manoeuvrable that I wonder if it might make both a camping boat and a day boat. P&H have very kindly offered me a loan of one for a long term test and I look forward very much to that. Everything I have said about the Cetus applies to the Cetus LV except that the LV is much smaller. I could hardly squeeze in. Despite its smaller size, I didn’t find the Cetus LV any more manoeuvrable than the Cetus. I think the Cetus LV is really for smaller paddlers who want a decent fit, rather than for big paddlers wanting more manoeuvrability. I noticed a very small paddler having a great time in this boat and he did not seem undully affected by the strong wind. waiting to hear your impressions on a following sea and surf with the Cetus since others have commented that it is a pig. Was the skeg on the Cetus the new generation one (stiffer than the previous)? If you speak really nice to those good people at P&H maybe, just maybe they would also loan your daughter the Cetus LV. It would be great to read your/her impressions of both boats. If if helps tell them that I brought a Nordkapp LV after reading your review of that boat. Gnarly, I will publish a full review once I have spent some considerable time in the Cetus. I had heard of some reports but my friend Mike Marshall (who is also an experienced surf kayaker) has just bought a Cetus after a long trial. I don't think he would have gone for one if there were problems with following seas or surf. The skeg adjuster was very stiff. Clive, I don't want to push my luck! Tony, I look forward to hearing how you get on. I submitted a long term review of the Cetus MV to Ocean Paddler which might be in the next issue early 2013. I liked it so much I have bought one!